Figuring out the best ways to accept credit cards online and choosing the right payment processor can be overwhelming at the beginning. It is the lifeblood of your ecommerce operation and a necessary cost to consider when selling online. If you can not properly take payments online, you have no business. More than 1/3 of consumers hesitate to shop online because of security concerns. The average business loses 5% of revenues to fraud every year. 50% of small businesses fall victim to fraud at some point in their business lifecycle. Resolving fraud costs an average of $114,000 each time. The average business loses a 5% of revenue to fraud every year. Resolving fraud costs more than $114,000. Beyond fees, fraud and conversion, your brand’s ability to expand internationally can be squandered by your credit card processing choice. Do international buyers trust your chosen solution? Does that solution work cross-borders? Throw in each provider’s fees, contracts and fine print, and you have a wildly complex decision in front of you. You need to consider a myriad of factors, and how they affect your business. There is no right or wrong answer — only what works best for your unique set of circumstances. Before we begin, know that there are three types of payment processors: merchant account + payment gateway, all-in-one solutions and simplified credit card processors. Here’s a quick overview of each. The traditional method for accepting payments online has been a combination of a merchant account and a payment gateway. Providers like SecureNet (USA), Authorize.Net (USA) and eWay (Australia and UK) fall into this category. A merchant account is a special kind of business bank account that lets you accept credit card payments. An online payment gateway connects your store and your merchant service account, and facilitates the processing of the payment transaction between the various parties involved, including your bank and the card issuer’s bank. Think of it as the digital version of a POS card swipe machine used in brick-and-mortar stores. There are fees associated with both the merchant account and payment gateway, but there are a lot of options out there, and some have more competitive transaction fees or don’t charge setup fees. Payment gateways can also offer greater control over security rules and customization; they may be a better fit for large businesses needing a more tailored solution. One thing to note about using a merchant account/payment gateway combo is that you’ll need to apply for both, usually filling out forms and providing some financial information. Processing your applications can take a few days, so you won’t be able to jump right into accepting payments. After both have been approved, you’ll need to connect your account to the gateway and then your gateway to your store. Usually this involves configuring your store with API keys, shared secrets and tokens. The benefits to using a payment gateway are that you usually have more handholding and personalized customer service along the way because the providers are large companies with big support organizations. Often you’ll be able to get a person on the phone to answer your questions. These services, including PayPal and 2Checkout, combine an account and gateway into one solution, which can make setup quicker and easier. They allow you to take all major credit cards and usually have favorable transaction rates. Plus most don’t charge monthly or setup fees for basic accounts, although you do have to pay a monthly fee for certain added features on some services. Services like PayPal make setup quicker and easier. They also allow you to take all major credit cards and usually have favorable transaction rates. In the past, one potential downside was that they didn’t always offer a seamless checkout experience. Depending on how your solution was set up, your customers may have been redirected off your site to pay for an order. This is no longer true. 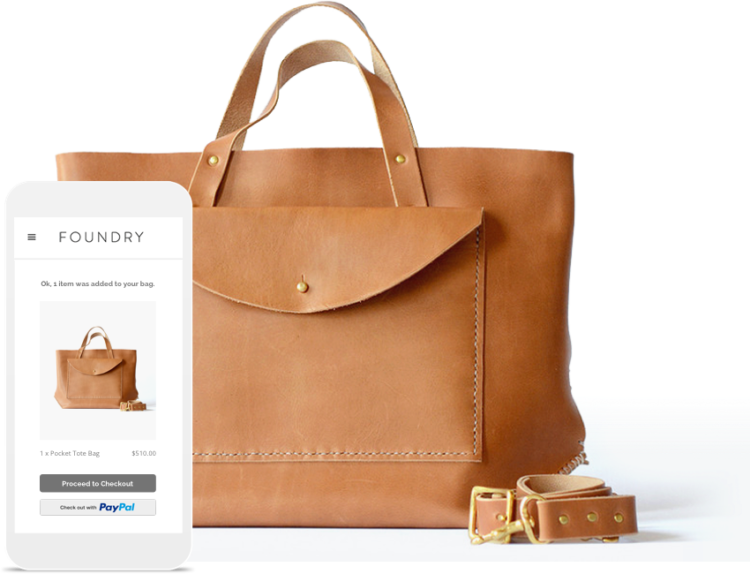 With PayPal powered by Braintree and One-Touch technology, you, the business owner, get to decide what your customer’s checkout experience is like. And this is important, because PayPal is incredibly popular. It has more than 100 million users and powers 60% of online transactions. We recommend combining PayPal with another service — that way shoppers who prefer it can choose it, and those who don’t can have another option. Services like Stripe have removed much of the complexity out of taking payments online. From a merchant’s perspective, these are very similar to the all-in-one solutions, but they usually integrate seamlessly with your store’s checkout, meaning the shopper never leaves your site. And they can be much quicker to set up — you can start taking various payment methods in a matter of minutes. With these simplified payment processors, there’s no need for a merchant service account or payment gateway, and that translates to fewer fees. With these simplified payment processors, there’s no need for a merchant account or payment gateway, and that translates to fewer fees. Rates are competitive with the all-in-one solutions, and most of these new processors also don’t charge setup or monthly fees. The experience is straightforward: the customer credit card is entered, and the payment processed — simple as that. One thing to consider before choosing a simplified processor is that you usually don’t get quite the same level of traditional support. They tend to be very easy to use, so you may not need it. But if you do run into a problem with your credit card processing company, most support is done as self service via articles or through email — many of these providers don’t even staff a call center. For those looking for a top-level view of the issue, and a speedier read, here are the most important questions to ask a potential payments processing provider before you choose to use their services. 1. Are there different rates or fees associated with different types of cards? Some services charge different fees to process different types of card transactions –– e.g. personal, business, debit and rewards cards –– as well as for different transaction amounts. Make sure you know exactly what you’ll be paying to process each type of transaction. 2. Do you charge “billbacks,” or are all charges related to a transaction billed in the same month? It’s not unusual for a payment processor to entice you by quoting low rates. But sometimes that low rate only applies to certain types of cards (see question one). You may only find out after the fact that many of your transactions during the month didn’t qualify for that low rate. For example, in January, you think you’re getting a 1.7% rate on your credit card transactions, but you processed several rewards cards. Even though you processed the transactions in January, come February, your processor charges you back, or bills you back, a higher rate. Now you have two different statements with two different rates for the same transaction, which makes it much harder to figure out the actual rate you’re paying. 3. What rates or fees do you charge when I swipe credit cards, enter them manually (key-enter) or accept them online? To compensate for the risk of fraud, processors charge different rates depending on how you process a payment. Because there is less fraud associated with cards that are physically swiped in a terminal (after all, you check IDs, right? ), there is usually a lower rate. If someone calls you to buy something and gives you their number over the phone, the chance of foul play goes up a bit, as does the processing fee. Online purchases have the highest incidence of fraud, so payment processors cover their risk by charging a higher rate. Make sure you know what those rates are and then figure out how much of each type of processing you’ll do to get a rough blended rate. 4. Do you charge a separate fee for your gateway? It’s pretty common for processors to charge a separate fee for their payment gateway, usually on a per-transaction basis. So in addition to the standard transaction fee –– say 2.9% + $0.30 –– you’ll pay a gateway fee for each transaction. 5. When I refund a transaction, do I get back any of the initial fees? Most credit card processors keep all of the fees for return transactions, and will most likely even charge an additional fee to process the refund. That means you can lose money every time a customer returns something. Be sure you are clear on how this process works, as it should inform your return policy. Many merchants sidestep this cost by issuing store credit for a returned item, rather than a refund. 6. What are the contract terms and are there early termination fees? Most credit card processors impose a contract term for a specific amount of time, often one or two years. Many times, early termination or cancellation fees are part of the agreement. That’ll make it difficult for you to switch processors if you’re unhappy with how your account is handled. 7. What fees do you charge each month? This question is deceptively simple since some processors might provide you with a seemingly small upfront monthly fee. But be sure to dig deeper — some additional fees might be hidden in the fine print. These can include fees for batch processing or fund transfers from a merchant account to your bank account, as well as statement fees. Processors might “waive” some of these fees to get your business, but could add them back in after a promotional period. 8. Is there a monthly minimum processing requirement or fee? Some processors charge a monthly minimum fee, which you’ll pay if your monthly transaction volume falls below a certain amount. This can be a significant financial pain for early-stage businesses with few monthly credit card transactions. 9. Is there a limit on how much I can process? Many processors limit the amount you can process based on your initial approval with them. Obviously, this can be frustrating if your business grows quickly or has a busy season — not to mention the negative impact that turning down orders will have on your business. 10. What type of support is offered? When your payments hit a snag, will the processor be there to support you until you’re back up and running? Further, an automated phone system isn’t the same as speaking to a live person, so make sure to ask if they have live customer support. Low rate processing fees don’t mean much if you can’t reach someone to help when you need it most. From who is involved in every transaction to how payments are processed to fees and policies, discover everything you need to know to get started taking payments online.